Newspapers are filled with obituaries and profiles that help us better understand the lives of our ancestors—and the famous people who lived during their times. The following newspaper articles about these three famous Americans are good examples. Daniel Boone, who died 26 September 1820, is one of the most famous figures in American history, a legendary frontiersman, hunter and explorer credited with opening up the area now known as Kentucky to white settlers. In his long, adventurous life, Boone was an officer in the American Revolutionary War; a captive of the Shawnees, who later adopted him into their tribe; and a successful politician, serving three terms in the Virginia General Assembly. When he died in Missouri in 1820, all of America mourned. 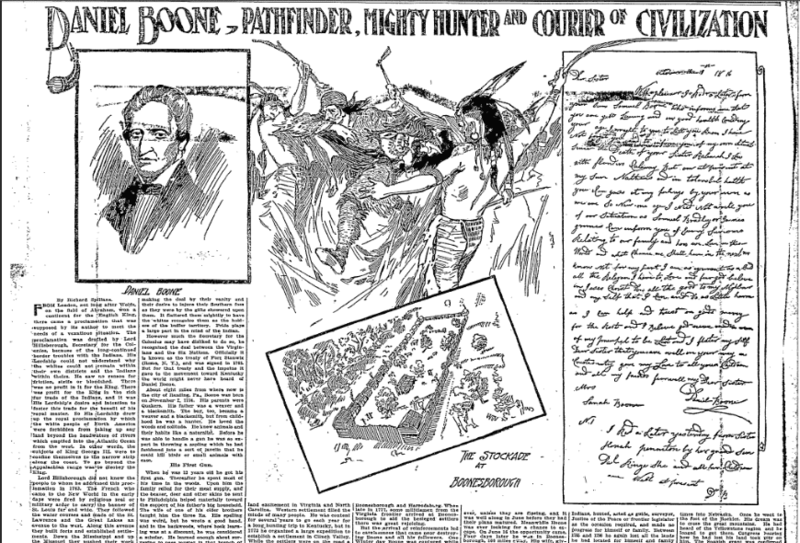 The St. Louis Enquirer published Boone’s obituary four days after he died. Today Daniel Boone is regarded as the quintessential American folk hero, and in this contemporary obituary we can see that he was held in high regard during his own time. 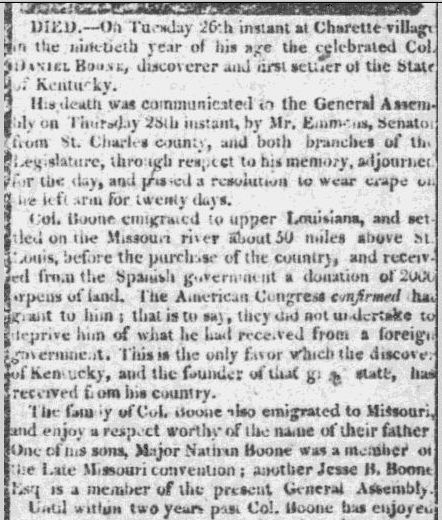 When the Missouri General Assembly learned of Boone’s passing they sadly adjourned for the day, pledging to wear black armbands for 20 days as a sign of respect and mourning. 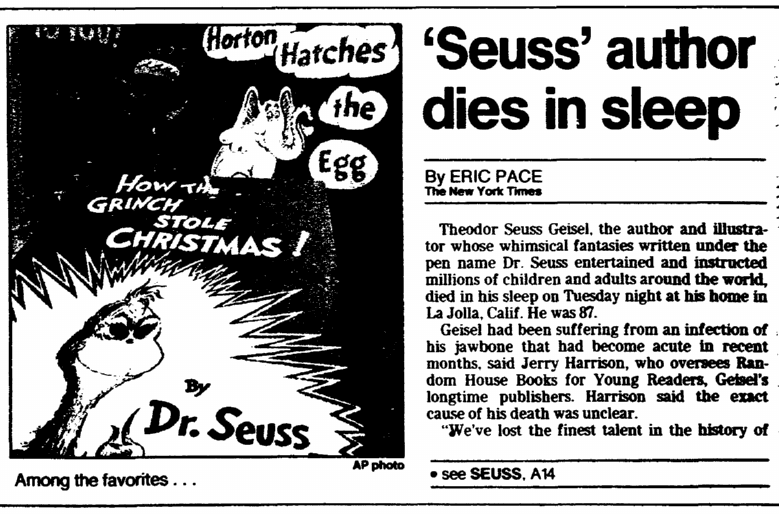 Best known as the author and illustrator of beloved children’s books, Theodor Seuss Geisel was also a novelist, poet and cartoonist. His vivid imagination, crazy rhymes, and colorful illustrations graced 46 children’s books, creating such enduring characters as “The Cat in the Hat” and “Horton” the elephant. Generations of American children grew up learning to read from such classics as The Cat in the Hat, Green Eggs and Ham, and Horton Hears a Who! In this obituary, published two days after Geisel’s death on 24 September 1991, we learn how the wild animals that peopled his imagination and stories came from his childhood experiences in the zoo. “The world of Geisel’s imagination was nourished by his childhood visits to the zoo in Springfield, Mass. He was born in Springfield on March 4, 1904, the son of Theodor R. Geisel, the superintendent of parks, and Henrietta Seuss Geisel. “Superintendent Geisel, the son of an émigré German cavalry officer who founded a brewery in Springfield, expanded the zoo and liked to show it off to his son. 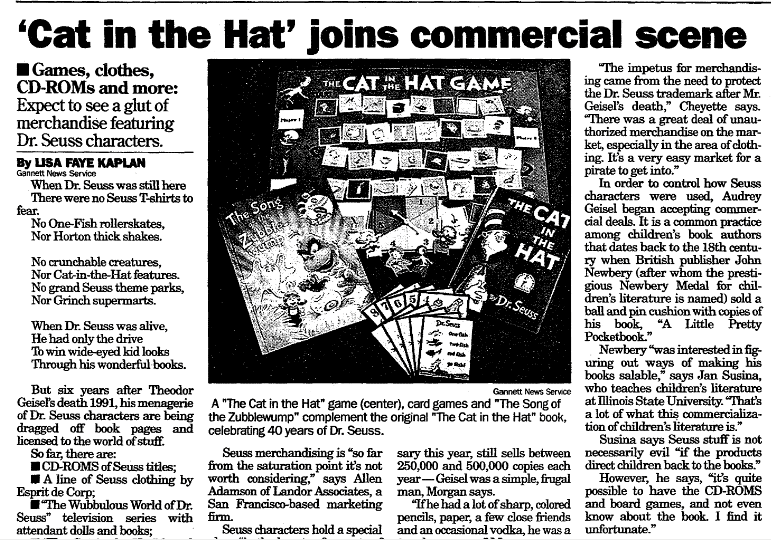 Geisel did very little merchandising of his popular characters during his lifetime—but that all changed after he died, as reported in this 1997 newspaper article. Paul Newman was an Academy Award-winning American actor who appeared in more than 60 movies during his long career. Gifted, handsome, famous and wealthy, Newman shunned the Hollywood lifestyle and preferred his home life with his wife Joanne Woodward, to whom he was married 50 years—right up to his death. Newman also was a great philanthropist, co-founding a food company called “Newman’s Own” that donated more than $330 million to charity during his lifetime. 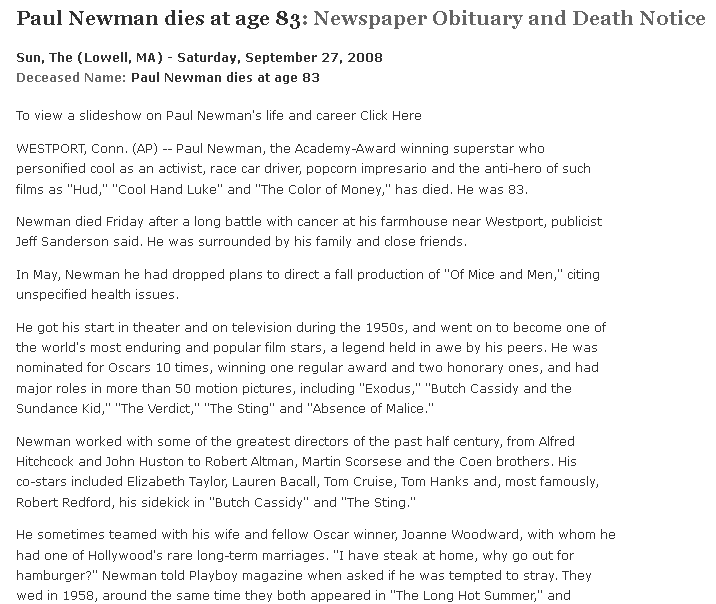 Paul Newman died on 26 September 2008; the following obituary was published the very next day. “Newman, who shunned Hollywood life, was reluctant to give interviews and usually refused to sign autographs because he found the majesty of the act offensive, according to one friend. “He also claimed that he never read reviews of his movies. “‘If they’re good you get a fat head and if they’re bad you’re depressed for three weeks,’ he said. 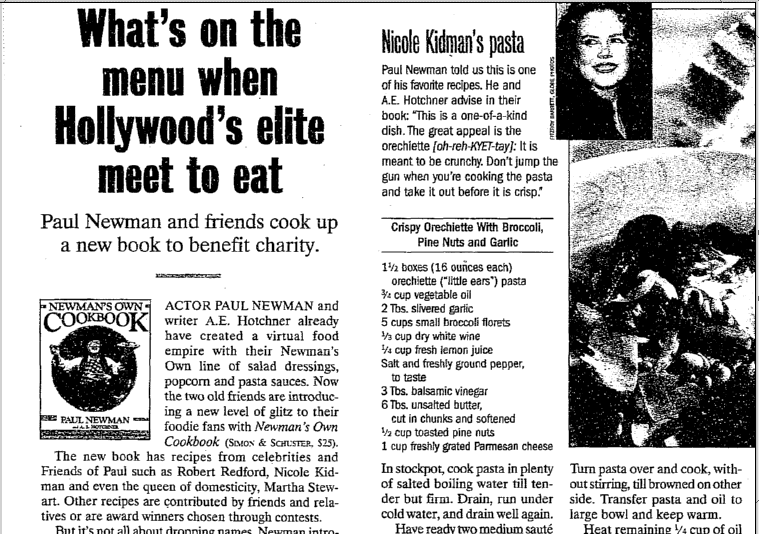 The following 1998 newspaper article reports on one of Newman’s charitable endeavors: he published a cookbook featuring favorite recipes from his famous actor friends. Dig into these obituary archives today and see what you can discover!